Leading simulation and measurement tool provider Fluxim and OLED-Info have teamed up to offer a 20% discount on Fluxim's large-area OLED simulation software LAOSS. 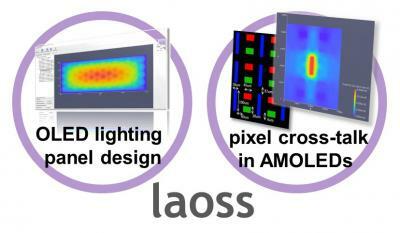 LAOSS simulations for OLED devices can produce a wide range of different output data, such as IV curves, 2D visualization of the electrode’s electric potential, current density and power dissipation, and more. OLED-Info readers that are interested in this discount, please contact us here. Fluxim offers software evaluation so testing of LAOSS is possible before any purchasing decision.